Early April brought heavy rains to Austin. But it didn’t solve the ongoing problem with drought. 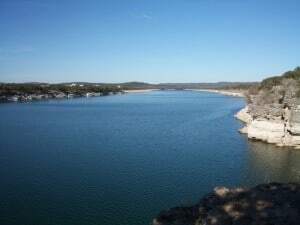 The Lower Colorado River Authority (LCRA) website states that Lake Travis remains about 39 feet below its average for this time of the year and that Lake Buchanan is about 21 feet below average. Both are at just 41 percent of capacity. Statewide the statistics are equally dismal. A recent article on Dallas Morning News.com quotes Texas state climatologist Dr. John Nielsen-Gammon as saying that Texas is overall at 66% water conservation storage capacity for spring. This figure is down from 78% in 2012 and is 6% below the historical low of 72%. Nielsen-Gammon predicts that even if rainfall levels are normal, reservoir levels in the state will fall below 50% capacity by early September. However, if current drought conditions persist, things could actually get much worse. Climate experts have linked the long dry spell in Texas and throughout the Southwest to La Niña. This phenomenon causes water temperatures in the central Pacific to dip by three to five degrees. As a result, moisture travels further north than usual. But La Niña has now retreated and Pacific water temperatures are close to normal. What is keeping the current drought active is another phenomenon at work off the Eastern seaboard called the Atlantic Multidecadal Oscillation or AMO. The AMO is presently in a warm phase. Nielsen-Gammon has pointed out that a warm AMO was present during two especially bad drought periods in the 1930s and 1950s. He has also stated that Texas could be in for a dry spell that could last until 2020. At South Austin Irrigation, we believe that knowing how to use available resources wisely is key to maintaining healthy landscapes. This means choosing drought-hardy plants, following Austin Water Utility water use guidelines and making smart irrigation system choices. So when you need the service and advice of experts, contact us! Get your irrigation system adjusted! Texas A&M researchers have looked at how your lawn can survive best during times of water restriction and what kind of irrigation setup is best. While they have concluded that you cannot keep the kind of lush, green lawn you might want, it is entirely possible to have your lawn survive with the right kind of watering. The study was done at the Texas A&M Turfgrass Field Lab in College Station. 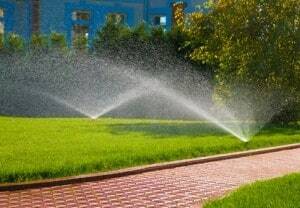 Irrigation timing and sprinkler-head types were compared so that they could produce some guidelines on how to maintain a healthy lawn with only watering two days per week. The project started with a six turf plots seeded with St. Augustine and Bermuda grasses back in fall 2010. All of the plots were watered with a total of one inch of water each week with half the plots on a two-day schedule and the balance getting the water over four days. This year, all of the plots, went onto a two-day schedule with the total amount of water delivered reduced (down to 1/4″ and 1/3″ each watering day). Various sprinkler heads were also tested – MP rotator, rotors, sub-surface drip and spray. 1. If your lawn starts out healthy, it will survive with less water. But it must start out healthy. 2. Drip irrigation is the best kind of irrigation system. Then in order of performance came spray heads, the MP rotator heads, and last, rotor heads. 3. 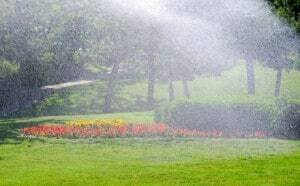 Any irrigation system needs to be adjusted so there is no overspray onto walkways, driveways, etc. It is estimated that poorly adjusted systems can lose up to 50% of the water through runoff. 4. The timing of the water is important. In cities, there are no restrictions on how much water is used, only the times you can water. But if too much water is put on, this is inefficient and much is lost to runoff. 5. Homeowners need to keep on top of their irrigation system. They need to check how it is performing regularly. 6. The study also found that “brown does not always equal dead.” The good news is that the grasses go dormant due to the lack of water and even if some brown is there, will respond to rain, particularly if the grass was healthy to start. If you need your irrigation system checked out and properly adjusted, South Austin Irrigation is the right place to call. 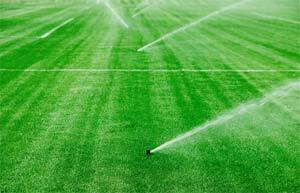 We look forward to helping homeowners keep their lawns and property in the best of shape despite water restrictions. Please give us a call to service your system today. Did you know that landscape irrigation wastes almost one and a half billion gallons of water every day and accounts for as much as 60% of urban water use? That’s a lot of water, especially in as dry a state as Texas and especially during the high-use water season of summer. But there are ways you can water your lawns and gardens more efficiently. New irrigation technologies can reduce your water use by up to 50%. 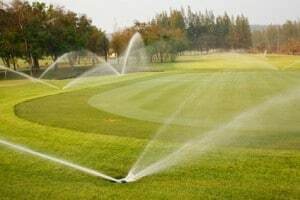 Operate your irrigation system during the cooler hours of the early morning rather than during the heat of the day or when the winds are high. Forgo frequent shallow waterings and opt for deeper, less frequent ones instead as this encourages deeper root growth. When you use fertilizer, your lawn will require more watering. This in turn creates the need for more mowing which can lead to increased water consumption. Remember, longer grass means less water evaporation. The texture of the soil has a direct influence on water retention, drainage and aeration. Remove existing weeds that may compete with other plants for sunlight and nutrients and add a thick layer of mulch to insulate the soil against moisture evaporation. Stick with as many native plant species as possible that are from your climate zone and group trees, shrubs and perennials according to their watering needs. Put low water users away from buildings or where water may not be readily available. Unfortunately, lawns require a lot of water and maintenance. Use them only where they can serve a purpose rather than as ornamentation. Keeping your lawns and gardens beautiful during the hot Texas summers can be a challenge. But with a little help from South Austin Irrigation, you can maintain landscape health while saving money and water. Don’t settle for high water bills or brown, dried-out landscapes. Contact us today and discover the South Austin Irrigation difference! You’re thinking about converting your current multi-zone lawn irrigation system into an electronically-controlled model with control and relay set-up for the pumps. But you’re concerned that if one of the valves that’s part of the system fails to open, then you might have a problem with too much pressure which could damage the pumps. You wonder — what kind of set-up would help to shut off pumps in the absence of pressure or flow? Flow sensors with paddle wheels exist that can actually measure the flow rate in the pipes in gallons per minute (GPM) or cubic feet per minute (CFM). However, they do require that you have a specialized irrigation controller that can work with them. This may mean that you need to upgrade your current controller. The irrigation controller measures the flow and compares it to the pre-programmed flow that should be present in the system for the valve that is currently open. The controller then makes a decision based upon that measured amount. If the flow is too low or too high, it can shut down pumps or close the master valve that shuts off the water to the entire system. The sensors themselves should be installed in a tee on a straight length of pipe. The length of the straight pipe should be approximately five times the pipe diameter before the sensor and five times after it. The reason for this is to reduce water turbulence in the pipe which can cause inaccurate pressure readings. You can also use a pressure sensor and pump logic controller to turn off the pumps at high pressure or very low pressure. It’s important to be aware that the sensor is a little different from the typical pressure switch. A standard switch turns the pump on at low-pressure and off at high pressure. The logic controller is basically used as a detector and timer. You should also know that it’s normal to have a pressure spike as the system changes from one valve to another. This is because it defeats the purpose of the setup if the pump shuts off during the switch of valve zones. You also need a delay to allow the pump to start up since there will be no pressure until it gets going. The pressure sensor also needs to be on a straight pipe section, just like the flow sensor. Lawn irrigation systems can present a host of challenges to novice landscapers. South Austin Irrigation can help you reconfigure old systems with a minimum of hassle and a maximum of cost efficiency. When you need expert advice and service, contact us! If you live near a stream, river, pond or lake, you may be wondering whether you can use the water present in those bodies as sources for irrigation projects you may have. While it is physically possible to do this, you need to do some research before you make any kind of equipment investment because failure to do so could cost you more than you bargained for. To begin, you need to make sure that you have the right to take water from non-municipal water sources. This means that you will have to talk not only with officials at the U.S. Fish and Wildlife Department, but also the Environmental Protection Agency (EPA) and maybe even state regulators. If you don’t, you risk incurring huge fines and other penalties. If you get clearance to use the water for your land, it’s not difficult to construct a pumping system to get the water where it needs to go. You’ll need to get a portable pump that you can mount less than eight feet above the water level–the closer you can get it, the better. You’ll also need to get a pad that you can put under your pump. You may opt to use a submersible pump instead of a portable one. But you should beware that a submersible should not sit on the bottom of a stream or river if there’s a lot of mud and silt that could get sucked into the pump. Many individuals find that the best place to locate a submersible is on the side of pier pilings. You’ll also need to set up a control system for the pump. If you opt for something simple and manually-operated, the costs will be much less than if you need to get an electrician to do the wiring for an automated system. One option you may want to consider is a pre-constructed pump unit, which allows you to hook up the necessary pipes and wires and turn it on. It would also be wise to invest in a storage tank for the water. If you do this, you could pump a small flow continuously from your water source to fill the tank. Then, the water would be pumped directly out to the irrigation system by a second pump. It could also be located three feet or more above the level of the irrigated area, which would allow you to use gravity flow from the tank for watering purposes. Regardless of the nature of your irrigation project, the experts at South Austin Irrigation can get you going on the right foot. We’re here to help you save time, money and one of our state’s most precious natural resources, water. When you need advice, equipment or repair services, let us be your one-stop go-to source in the Austin area. Contact us today!